On September 30, Myanmar’s parliament approved the government’s proposal to accede to the 1972 Biological Weapons Convention (BWC). The proposal to accede to this convention, which bans the development, production, and stockpiling of biological weapons and which Myanmar had signed the year of its inception, was submitted to parliament by Thant Kyaw, deputy minister for foreign affairs, who stated that “Over 170 countries have already ratified the BWC. All ASEAN countries have except us.” Later, he added that Myanmar’s accession would demonstrate its commitment to abide by nonproliferation rules. BWC endorsement is Myanmar’s latest nonproliferation achievement. It follows a series of important nonproliferation actions that Myanmar has taken since the government’s decision in early 2011 to break away from the junta’s traditional authoritarianism and to implement sweeping reforms and open the country to the world. In June 2011, Myanmar announced that it had abandoned its nuclear research program to allay international concerns about its nuclear capabilities and intentions, which had been brewing since the early 2000s. Ahead of US President Barack Obama’s historic visit to the country in November 2012, Myanmar then stated that it would sign an Additional Protocol (AP) and submit a modified Small Quantities Protocol (SQP), both of which would allow international inspectors to verify that its nuclear activities are strictly for peaceful purposes. Less than a year later, on September 17, 2013, Myanmar signed an AP and has since been working relentlessly toward its entry into force and the submission of a modified SQP. In addition to burnishing its nonproliferation credentials in the nuclear realm, Myanmar stressed in December 2013 that it was making preparations to endorse the conventions banning biological and chemical weapons. Now that it has acceded to the BWC, next on the list is the Chemical Weapons Convention (CWC), which it signed in 1993, the year it was concluded. In recent months, Myanmar has been working with the Organization for the Prohibition of Chemical Weapons (the CWC’s verification body) and other entities to prepare implementation of CWC requirements when it accedes to the convention, which Myanmar officials and experts now say is “imminent.” CWC accession is particularly important given past accusations by armed rebel groups that the Myanmar military had used chemical weapons in their war in the country’s borderlands and, as recently as this year, the allegations made by the Unity Journal that the military had built a chemical-weapon production facility in central Magway district. These allegations, which the government flatly denied, led to the arrest of several journalists and raised important concerns in the nonproliferation community that only CWC accession will be able to resolve: the CWC includes an intrusive verification regime that will allow international inspectors to ensure that no chemical weapons are produced – or have been used – in Myanmar. In its efforts to become a nonproliferation role model, Myanmar will also need to demonstrate commitment in other areas. At present, for instance, it does not subscribe to the Hague Code of Conduct against Ballistic Missile Proliferation (HCOC). Endorsement of the HCOC, which politically binds its members to curb the proliferation of ballistic-missile technology, exercise maximum restraint in developing, testing, and deploying such missiles, be transparent regarding missile inventory, and issue pre-launch notifications, would be a positive development. Thorough implementation of United Nations Security Council Resolution 1540, which calls for the adoption of appropriate and effective legal and regulatory measures against the proliferation of nuclear, biological, and chemical weapons and their means of delivery, would be another important move. This should begin with the drafting of a national action plan that maps out implementation priorities and plans, thereby enabling donor states to provide Myanmar with the assistance it needs. Adoption of stringent strategic trade controls and endorsement of the Proliferation Security Initiative (a multilateral effort that commits participating countries to interdict shipments of nuclear, biological, chemical, and missile technology and materials) would also considerably raise Myanmar’s nonproliferation profile. Finally, Myanmar needs to comprehensively implement United Nations sanctions resolutions imposed on North Korea and, if it wants an unblemished nonproliferation record, it will have to cease military trade with Pyongyang, which continues to this day. Avoiding all military trade with North Korea is critically important. The United Nations Security Council bans weapons sales from North Korea as part of its efforts to prevent funds from going to its nuclear and missiles programs, which the Council deems a threat to international peace and security. Myanmar is committed to nonproliferation. During the First Myanmar-US/UK Nonproliferation Dialogue run by the Pacific Forum CSIS in partnership with the Myanmar Institute of Strategic and International Studies (the ministry of foreign affairs’ think tank), and held in Yangon in February 2014, one Myanmar participant stressed that “All these [nonproliferation] conventions are on our radar; we’re working hard to adopt them.” Throughout the dialogue, Myanmar participants made clear that they want their country to be “in full compliance” with the nonproliferation regime. But they also pointed out that Myanmar has limited resources and multiple priorities as it opens to the world and transitions toward democracy. In other words, while it is willing to endorse nonproliferation rules and norms, it lacks the capacity to do so. 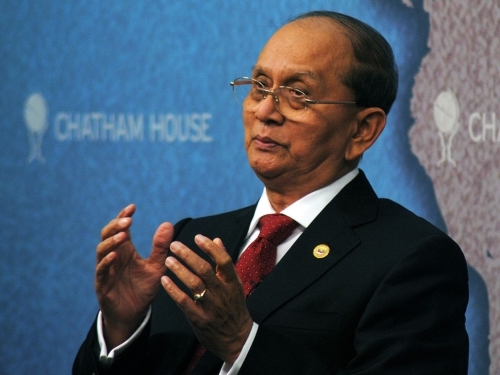 This means that efforts should be made to build nonproliferation capacity in Myanmar. Building technical expertise is particularly essential because as Myanmar endorses nonproliferation instruments, it will need a critical mass of highly specialized people to implement them. Endorsement of a nonproliferation instrument, after all, is only the beginning of a long and often complex implementation process. Myanmar, for instance, is still working toward the adoption and entry into force of the AP it signed in September 2013. Now that it has acceded to the BWC, Myanmar will need to put in much work to implement it in its national laws and regulations and, after it accedes to the CWC, turn its attention to implement this convention as well. These processes are time-consuming, resource-intensive, and demand a solid pool of experts, and Myanmar only has so many. The Pacific Forum CSIS, with the support of the US Department of Energy’s National Nuclear Security Administration and the UK Foreign and Commonwealth Office, has initiated an ambitious nonproliferation capacity-building initiative, which includes a biannual training course taught in Yangon (the first round of which took place last month) and fellowship opportunities for Myanmar nationals. Several governments, international organizations, and non-governmental organization (notably the Verification Research, Training, and Information Centre, known as VERTIC) are also providing Myanmar with important forms of capacity. This is encouraging, but more efforts are needed to help Myanmar’s quest for nonproliferation excellence. David Santoro (david@pacforum.org) is a senior fellow at the Pacific Forum CSIS.